Skippers Retreat in Clachan Sands, Isle of North Uist, Outer Hebrides sleeps 4 people. 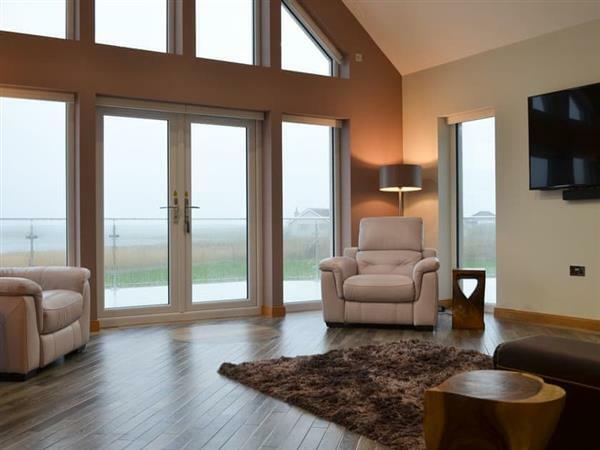 Skipper’s Retreat in Clachan Sands looks out over the magnificent Clachan Sands; this modern luxurious island holiday home boasts fabulous attention to detail. This single-storey, detached cottage has mood lighting throughout, a magnificent steam room, rain shower, whirlpool bath, electric lazy boys - the list goes on! The thoughtful owners have included everything to make sure your stay is as comfortable as possible. With the owner being a fisherman, guests will even receive a complementary seafood delivery (weather permitting). With miles of white sandy beaches, turquoise seas and a blanket of rare flowers turning the famous machair into a shimmering mass of colour, the Isle of Uist is undoubtedly beautiful. The incredible landscape surrounding Skipper’s Retreat is a paradise for bird watchers with hen harriers, sea eagles, golden eagles and the elusive corncrake just some of the most iconic birds seen. Surrounded by an abundance of wildlife, seals and otters are often spotted, whilst basking sharks, dolphins and whales visit during the summer months. You can catch a ferry nearby to explore the popular islands of Harris and Lewis, or head south to Eriskay and Barra for a superb day out. Outdoor enthusiasts will be spoilt for choice, with a variety of activities to choose from including hill walking, surfing, fishing, golf, diving, sea kayaking, cycling and wild swimming. Photographers and artists will not be disappointed with dramatic landscapes, spectacular sunsets and an opportunity to see the spectacular Northern Lights. The Outer Hebrides are truly unique and Skipper’s Retreat will make you wish you could stay longer. The beach is 200 yards from Skipper’s Retreat in Clachan Sands. With the shop 6½ miles, and the pub & restaurant is 7 miles from Skipper’s Retreat. Living room: With 65 Sky Q Smart TV, double sofa bed (for flexible sleeping arrangements), and USB socket. Bedroom 2: With double bed, 42 TV, dressing area and en-suite with whirlpool bath and toilet (also accessed from hallway). Holidays at Skippers Retreat run from Friday to Friday. For a better idea of where Skippers Retreat is, you can see Skippers Retreat on the map below. Do you want to holiday near Skippers Retreat (UK10648), you can see other cottages within 25 miles of Skippers Retreat; have a look to find your perfect holiday location.